I had lunch with an old school friend recently (I had not seen Lucy since our debs). She has been living in the big apple, NYC for a lot of years, so I was really excited to see her. She was staying in Co. Clare, and as I was traveling from Galway, my first challenge was to find somewhere between the two places that was pretty enough to bring this honorary American for a spot of lunch. Kinvarra was recommended by himself and a quick trawl of the interwebs led me to pick a seafood restauraunt that had few Bridgestone awards. But this Bridgestone had past its ‘sell by’ date. It was pretty grim. The only saving grace for me was a bread and butter pudding that was overly sweet, but it was pleasant enough. This is a long winded way of introducing the best bread and butter pudding recipe ever – and easiest. It’s particularly good to keep in mind at Christmas when the main ingredient is plentiful and easily found. 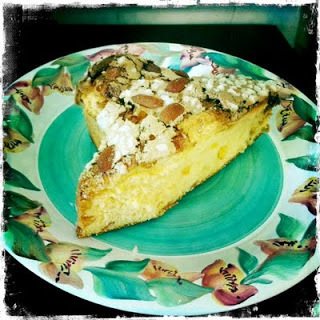 Panetonne is a traditional Italian Christmas cake, buttery and full of flavour. Simple to make and totally delicious panetonne bread & butter pudding has become our new Christmas dessert. This pudding has all the vanilla and fruit from the luxurious panetonne instead of plain bread, but do leave it to dry out sufficiently as this is essential to soak up the custard (if you have a very fresh panetonne, and need this in a hurry, cut it into slices the day before and it will be sufficiently dried out the day after). *I say here that it serves 6, and it should, but it won’t, 4 greedy people can finish this off without a bother. The custard is less forgiving – use cornflour to make it more stable or do what I do and make sure you have enough ingredients to make it twice when you inevitably curdle it the first time! When adding the mascarpone it’s important to add some warm custard to the mascarpone first and mix until smooth. Then mix it back into the custard (If you try to mix it straight in you’ll have lumps of mascarpone floating in the custard). Bring 200ml of milk & 300ml of double cream to the boil. Whisk 3 eggs with 100g of caster sugar, the juice and zest from 1 orange, and the seeds from 1 vanilla pod. Add the hot milk and whisk together. Slice the Panetonne (500g) into thick slices and butter generously. Butter a ceramic dish and lay down 1 layer of buttered Panetonne. Cover with the liquid and repeat until you have 3 layers. Sprinkle the top with soft brown sugar and gently press. Place the dish in a deep oven tray, pouring in enough boiling water to come half way up the sides of the dish. Bake for 30 minutes – until a golden brown crust forms. Whisk 6 egg yolks with 75g of caster sugar, 40g of corn flour, 50ml of cold milk and the seeds from a vanilla pod. Pour in hot milk and whisk. Cook over a low heat stirring constantly until it thickens. Remove from heat and whisk a ladleful into 100g of mascarpone. Once smooth whisk that back into the custard. Pass through a fine sieve into a serving jug.